Celebrate vintage and Fall with the Vintage Fall Tree Candle Sleeve. 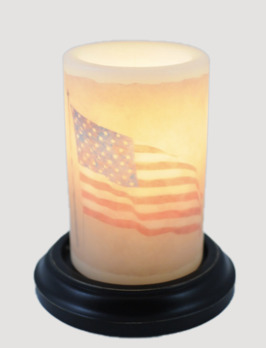 The candle sleeve is made in the USA. 6 watt bulb and the base of your choice (Antique White, Chocolate & Black) are all sold separately on our site. 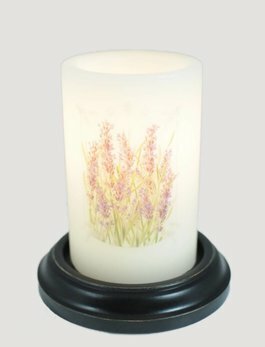 You're going to love this Lavender Fields Candle Sleeve! A perfect way to bring a touch of Spring into your home. Made in the USA. 6 watt bulb and the base of your choice (Antique White, Chocolate & Black) are all sold separately on our site. Old trucks hold the ingredients for a hayride after dark and that's the memory the Autumn Truck Candle Sleeve will bring back. Made in the USA. 6 watt bulb and the base of your choice (Antique White, Chocolate & Black) are all sold separately. 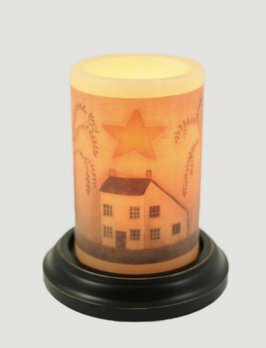 Here’s a beautiful addition to your primitive home, the Prim Saltbox House Candle Sleeve. The candle sleeve is made in the USA. 6 watt bulb and the base of your choice (Antique White, Chocolate & Black) are all sold separately on our site. 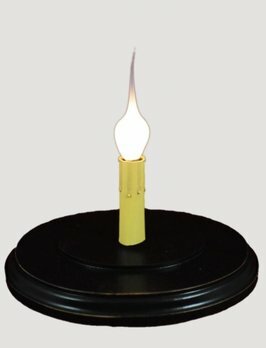 You'll love this Oval Black Candle Sleeve Base. Accented with a flame-tipped bulb & realistic candle drips, and designed & made just for the Oval candle sleeves we sell seperately on this site. One 6" bulb included. 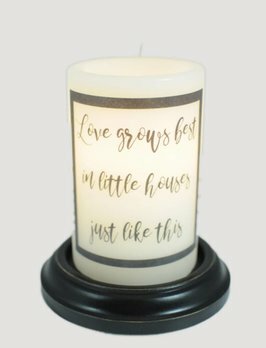 7" W x 85" L x 4.25" H.
The Love Grows Best Candle Sleeve is perfect for any home! It's not the size of the home that matters... right? Made in the USA. 6 watt bulb and the base of your choice (Antique White, Chocolate & Black) are all sold separately on our site. Here’s a beautiful way to remember every great Christmas, the Three Christmas Tree Candle Sleeve. 6 watt bulb and the base of your choice (Antique White, Chocolate & Black) are all sold separately on our site. You're going to love this Oval Gather Candle Sleeve! This candle sleeve is a reminder that your home is the place all you love are welcomed. 6 watt bulb and the base of your choice (Antique White, Chocolate & Black) are all sold separately on our site. You're going to love this Act Justly Candle Sleeve! This candle sleeve is not only beautiful but offers words of wisdom! 6 watt bulb and the base of your choice (Antique White, Chocolate & Black) are all sold separately on our site.